Today was the last racing day of the X-41 World Championship at La Marina di Scarlino in Maremma Tuscany, organised by the Yacht Club Italiano and Club Nautico Scarlino, with the collaboration of X-Yachts Italia. The first race of the day started at 12.20 with a 10 knot southerly breeze. 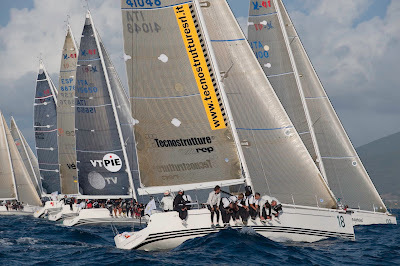 During the first stage of the race the Spaniards on board of Javier Dominguez’s Vertice 360-Benalmadena with tactician Luis Doreste took the lead. Siderarcordis (owner Pier Vettor Grimani, tactician Daniele Cassinari) was in hot pursuit followed by WB Five (helmsman Alberto Signorini, tactician Tommaso Chieffi) and by Lady X-41 (owner Piergiorgio Ravaioni, tactician Lorenzo Bressani). On the last run the Italians – jibe after jibe– managed to close in, eventually overtaking the Spaniards. Lady X-41 cut the finishing line first, followed by Vertice 360-Benalmadena second and by Siderarcordis third. The second race started at 1:45 p.m. with the same weather conditions. Le Coq Hardi, with tactician Francesco De Angelis on baord, took the lead at the start, closely followed by Siderarcordis. Le Coq Hardi lost ground on the first beat and Siderarcordis rounded mark 1 in the lead, followed by WB Five, Lady X-41 and Raffica. During the second upwind leg Siderarcordis changed tactics, choosing to sail on the far left side of the course, while WB Five kept to the far right. The race’s outcome was decided during the last run where Le Coq Hardi, WB Five, Siderarcordis and Lady X-41 engaged in a jibe for jibe battle. Siderarcordis crossed the finish line first, followed by Lady X-41 and by WB Five in third position. Given the great weather conditions the Race Committee fired the gun for the 3rd race of the day. WB Five and Le Coq Hardi had a good start on the pin end , but Pasquale Orofino’s Raffica with Paolo Semeraro as tactician managed to overtake the whole fleet and led throughout the whole race, crossing the finishing line first. Second Piergiorgio Ravaioni’s Lady X-41 and third Maurizio Pavesi’s Le Coq Hardi. Siderarcordis owned by Pier Vettor Grimani with Daniele Cassinari calling tactics were crowned winners of the X-41 World Championship after 8 races.. Piergiorgio Ravaioni’s Lady X-41 (tactician Lorenzo Bressani) finished second overall and Alberto Signorini’s WB Five (tactician Tommaso Chieffi) third. Winner OverallDaniele Cassinari tactician on board Siderarcordis and owner of North Sails Italia Northeast back on the docks said: “A great result - we have fought it out until the end. Today the first two races were great and in the second we also had a bit of luck that offset the bad luck in the last race. The crew is really good and was focused from the beginning to the end of this World Championship." 2 nd Overall"We should be happy because we climbed our way up from fourth to second place. But that is not the case” said Lorenzo Bressani, tactician on Lady X-41. “We came very close to winning the Championship but the decision taken yesterday by the Race Committee to abandon the race when there had been no major change in wind direction and we were sailing at 4.5 knots, strongly penalized us. We were in the lead and our direct rivals were fourth and fifth. Looking at the final rankings there might have been a different order. Hats off to Siderarcordis."